Attributes: Dairy Free, Gluten Free, Natural or Organic Ingredients, Vegan, Yeast FreeIngredients: Organic Ricemilk (Water, Organic Rice Syrup, Organic Rice Starch, Organic Rice Flour), Coconut Oil, Organic Maltodextrin from Rice, Tartaric Acid, Seaweed Extracts and Gum Arabic (Thickeners), Sea Sal.. Attributes: Gluten Free, Natural or Organic IngredientsIngredients: Organic Soymilk (Water, Soybeans), Organic Coconut Oil, Organic Fractionated Palm Kernel Oil, Organic Sugar-Beet Syrup, Organic Maltodextrin, Tartaric Acid, Carrageenan, Sea Salt and Natural Vanilla Extract. Propellant: Nitrous Oxid.. Attributes: Natural or Organic Ingredients, Non-GMO Project Verified , VeganIngredients: Organic Tofu (Filtered Water, Organic Soy Beans, Nigari [Magnesium Chloride, A Natural Firming Agent], Calcium Sulfate), Water, Organic Cane Sugar, Organic Coconut Cream (Organic Coconut Milk, Water), Organic To.. Attributes: Natural or Organic Ingredients, Non-GMO Project Verified , VeganIngredients: Organic Tofu (Filtered Water, Organic Soy Beans, Nigari [Magnesium Chloride, A Natural Firming Agent], Calcium Sulfate), Organic Soy Sauce (Water, Organic Soy Beans, Salt, Organic Wheat, Organic Alcohol [To Pres.. Attributes: Natural or Organic Ingredients, Specialty ProductIngredients: TOFU: Water, Soybeans, Calcium Sulfate, Calcium Chloride. SAUCE: Water, Sugar, Soy Sauce (Water, Soybeans, Wheat, Salt), Orange Juice Concentrate, Tomato Paste, Corn Starch, Contains 2% or less of: Salt, Ginger, Red Bell Peppe.. Attributes: Natural or Organic Ingredients, Specialty ProductIngredients: TOFU: Water, Soybeans, Calcium Sulfate, Calcium Chloride. 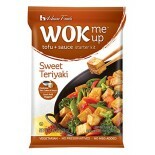 SAUCE: Sugar, Soy Sauce (Water, Soybeans, Wheat, Salt), Salted Mirin (Water, Rice, Dextrose, Corn Syrup, Salt), Water, Corn Starch Contains 2% or less of: Dehydrated Ga..